Shine once more, before the end! Thanks to popular demand, we are bringing back our Secret Santa event. Please comment down below if you want to participate. We would also like you to state if you are uncomfortable or comfortable receiving a physical gift. Of course, this means we will need your address. For your safety, Frosti or I will PM you for the address, DO NOT give it to anyone else/post it on here. Also, physical gifts are limited to those that are 13 years or old, thank you. Along with your comment, please include a short list of hints for the person who will be your secret santa. For example, if you would like art of a specific character, or if you have a favorite Pokemon that you would love to receive in plush version, mention that! It’s good to provide a wide description so that it’s easy for someone to come up with a gift for you. Not only will you receive a gift- you will get a special ribbon! However, you will only get this ribbon if you send/make a gift. If we see you complain about your gift, you will not receive it. If the gift lacks effort, you will not get the ribbon as well. Remember, you are not limited to physical gifts. You can draw, write, create music, base themes- anything that you can come up that would make a nice gift for that person. Do not limit yourself, get creative! If you don’t get a gift by December 31st, message Frosti or I and we’ll see what we can do. Sign up by December 9th! There will be no extensions to this deadline, as we need to assign everyone’s secret santa and leave time to make/buy/send gifts. i'm not comfortable recieving a physical gift unless a tracking number is available i, but i love musicals, marine mammals, and crime dramas! my favorite pokemon region is sinnoh. anything i post on here is fair game! I am comfortable sending/receiving a physical gift. For my secret Santa: I love anything Nintendo! My favorite game is Pokemon, and my favorite Pokemon are the Charizard line, Sceptile line, Haxorus line, Krookodile line, and Flygon. Other games I love include Metroid, Mario, Kirby, Animal Crossing, Pikmin, Spyro, and Metal Gear Solid. I would love to see any form of these things, be it digital art or physical figures/plush/etc! secret santa YEAH!! I'm in :'^) also I am comfortable sending + receiving physical gifts! Ooooooo I'd love to join this! I'm good with sending and receiving physical items. One thing I'm concerned about is how early I would need to ship it for it to arrive. Cute things? I guess something you'd look at and think "I want to pat it", whether it be a character or an animal. Art. Art is awesome. except when it's abstract, usually I don't get it. To be honest, anything given to me by someone is awesome in general? Edit: Since I'm struggling with thinking of gift ideas I thought whoever got me might also be struggling and would appreciate more ideas? I spend a lot of time playing mobile games, so a gift card is fine. Stuff for PC gaming? idk if you send me something super expensive like a mouse or keyboard I'll feel sorta bad. Cool anime stuff fuel my need for more trash. Either art or merch? 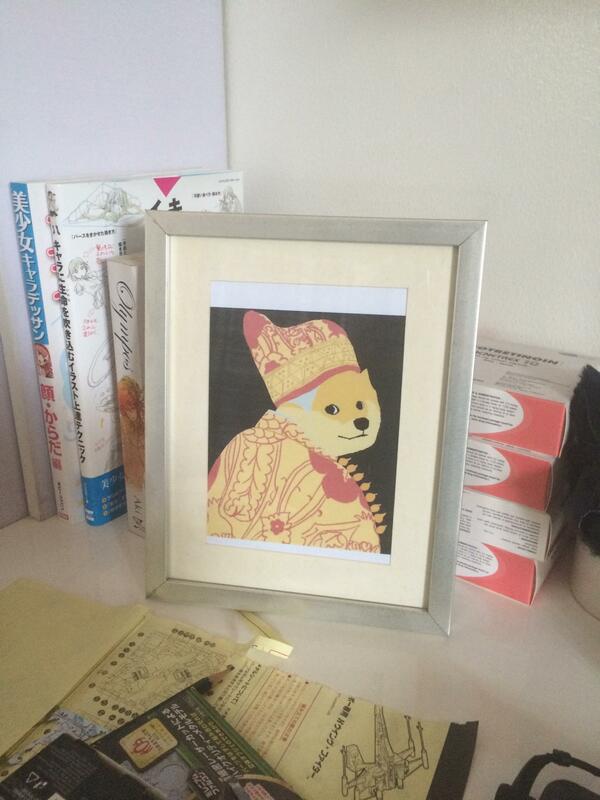 Some memey thing you drew, printed, and framed. If you send me a rock it should be an awesome looking rock. Take note that sending heavy packages is expensive so reconsider sending that rock. Of course I am joining in. I'll join in. I'm totally comfortable sending/revieving physical gifts and I really hope I'm creative enough to think of something if someone isn't. Though, I'm in Canada, so idk if shipping and stuff like that might be harder to deal with for anyone in the US or elsewhere. -Skyrim/Elder Scrolls is kinda the best thing ever. -Monster Hunter might also be the best thing ever. -Pokemon, especially Wooper, Absol, Misdreavus, and just Rock and Poison types in general. -Music stuff, specifically anything to do with ocarinas. -Fossils. I'll spend hours searching for fossils, no lie. -Weapons? I guess? I'm not a dangerous person or anything, but like... knives are really cool??? -Animals. By which I mean JELLYFISH. Sup guys I'm down for Secret Santa fun! ♥ I'm fine to receive physical gifts but I don't have the funds to send any (Danish postal prices are wild ): ). - I'm a sucker for dragons, crows and foxes. Literally anything about dragons, crows or foxes will make me happy. - My favourite Pokémon is the entirety of the Grass type. Dark comes close second. - Visually interesting stones and shells are 100%. Love me some of nature's patterns. - I'm still a Homestuck nerd and would actually die for the Strilondes. - If all else fails, puns. Bad puns, good puns, dad jokes, science jokes, music jokes. You could mail me a piece of toilet paper with a knock-knock joke written in sharpie and I would stick it to the fridge with a magnet and smile at it like it's the best thing since sliced bread. Here I am, joining my own event! Woohoo! I'm good with sending/receiving physical gifts. HeyGuys i can finally board this hype train!! i'm comfortable with sending and receiving physical gifts. if its alright, i would very much prefer to be matched w/ someone who wants a physical gift. mainly because i have nothing of value to offer over the internet lmao. > music!!!!!! vinyls/merch/memorabilia etc. there's a list of my fav bands on my base, in the sidebar. > jewelry! rings, bracelets, necklaces... whatever! > perfume/cologne. the stranger the scent, the better! > guitar related stuff. stickers, picks, etc. > hell, anything you think i'd like. No need to wait, go right ahead! You guys can open your presents whenever you get them!